Champagne: A free chart offers an alphabetical list of all the wines from Champagne reviewed for the tasting report in this issue. Global Sparkling Wines: A free chart offers an alphabetical list of all Global Sparkling wines reviewed for the tasting report in this issue. Port: A free chart offers an alphabetical list of all Port wines reviewed for the tasting report in this issue. WineSpectator.com: BONUS VIDEOS: What makes a wine a member of this exclusive club? Find out as Wine Spectator's senior editors discuss each of this year's Top 10 wines in a video series. 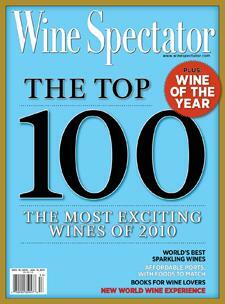 Plus, get a handy printable list of the full Top 100, at http://top100.winespectator.com. FREE: Port Alphabetical Listing - More than 35 wines were reviewed for this report. A free alphabetical list is available. WineSpectator.com members can access complete reviews for all the wines tasted using the online Wine Ratings Search. FREE: Champagne Alphabetical Listing - More than 330 wines were reviewed for this report. A free alphabetical list is available. WineSpectator.com members can access complete reviews for all the wines tasted using the online Wine Ratings Search. WineSpectator.com: BONUS VIDEO: Cristal Clarity: What's the difference between Roederer's non-vintage Champagne and the ultra-luxe Cristal (other than the price)? Join Jean-Baptise Lecaillon and Bruce Sanderson as they taste, and talk, bubbly. FREE: U.S. Sparkling Alphabetical Listing - More than 70 wines were reviewed for this report. A free alphabetical list is available. WineSpectator.com members can access complete reviews for all the wines tasted using the online Wine Ratings Search. FREE: Global Sparkling Alphabetical Listing - More than 170 wines were reviewed for this report. A free alphabetical list is available. WineSpectator.com members can access complete reviews for all the wines tasted using the online Wine Ratings Search. WineSpectator.com: For more about our first New World Wine Experience, including our Grand Tasting photo gallery and videos, check our online coverage. WineSpectator.com: In his latest blogs, James Laube shares updates from his most recent tastings and visits with winemakers, and he discusses hot-button issues in the wine industry. Join the conversation with other members. TOP 100 OF 2010 What makes a wine a member of this exclusive club? Find out as Wine Spectator's senior editors discuss this year's Top 10 wines in a video series. Plus, get a handy printable list of the full Top 100. VINTAGE REPORT CARD Get an early look at the expected quality in key regions in the Northern Hemisphere. HOLIDAY TIPS FROM THE EXPERTS We've got you covered from Thanksgiving through the New Year. Leading chefs provide recipes for some of their favorite holiday meals, while Wine Spectator editors recommend recently rated red, white and sparkling wines for your parties. Plus, get great ideas for the wine lovers among your friends and family. Taming Sangiovese: Castello Banfi's Cristina Mariani- May explains the different approaches taken with this great Tuscan grape for Brunello di Montalcino and for IGT blends. RECIPE SEARCH Discover hundreds of wine-friendly dishes-from easy meals to luxurious entrées-and search for recipes that pair well with your favorite wines. Education: Take any of Wine Spectator School's online courses, from the ABCs of Tasting to in-depth seminars on food pairing and the world's top regions. Cellar management tool: Create shopping lists, track your purchases and check the value of collectible wines with the Personal Wine List Expert tips for holiday get-togethers.